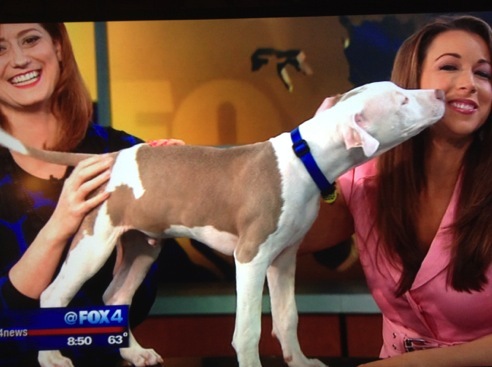 Adopt-a-pet segments are staples of weekend morning newscasts. On D-FW’s Fox4, they’re also something of an art form. Anchor Jenny Anchondo and meteorologist Jennifer Myers make these spots purr -- to the point where they’ve become almost mandatory feel-good viewing at unclebarky.com central. Near the end of Saturday’s show, Anchondo and Myers welcomed inquisitive Little Boy Blue, who licked his way through their makeup when not trying to see himself in a nearby TV monitor. His human acquaintances again seemed more than happy to roll with it. Myers generally is more of the hands-on handler while Anchondo gives viewers the Operation Kindness specifics on how and where to adopt. But just as often as not, they each get temporary custody of a play-along pet. Your friendly content provider with the pet-friendly surname invites you to take a look some Saturday morning. You’ll see that Fox4 clearly is best of show in this realm, with Anchondo and Myers making the very most of their time whatever furry buddy or buddies show up.